The big story with our next system due in Saturday will likely be additional snowfall for the mountains. Over the last week we’ve watched this system evolve, and while at times it’s looked to have potential for good snowfall across eastern Colorado, that has not been the case over recent days. Snowfall totals, generally, will range from a trace to 3” for areas north of the Palmer Divide, with a few areas across southern Colorado maybe seeing 2 to 4+”. The trend over recent days has been drier for the greater Denver metro area. The GFS which produced 0.13” QPF at 12z Thursday is down to 0.09” in its latest run. SREF means have also dropped nearly in half, from 0.09” 15z Thursday to to ~0.05” over the last 3 runs. The 12k NAM has been all but dry, and the EURO, which had been the wettest at 0.22” Thursday, produced a mere 0.04” last night and 0.07" in it’s latest run. While the models are certainly underwhelming, we do think there will be a round of snow Saturday, likely during the afternoon or evening hours. An Arctic cold front will precede the snow and bring another night of very cold temperatures to eastern Colorado -- likely single digit lows again by Sunday morning. Denver’s highs will likely be reached early in the morning Saturday, before steadily falling through the rest of the day. For snow totals we’ll go with generally 0.5 to 3” for now across the urban corridor and see what adjustments need to be made as we head into Friday evening. South of the Palmer Divide, and again north along the Wyoming border, there may be some areas that do a bit better -- many models show pockets of 2 - 5”, but are certainly not widespread. Colorado Springs, Pueblo, and again east toward the Kansas border is where we’ll need to watch here. The wild card may be jet-induced banding, which as you know can greatly vary snowfall totals over a (relatively) small area. Very similar to what we saw Wednesday, if you end up under one of these bands you’ll be on the high end of these totals, and if not… you may see little to no accumulation. Again, in general, this system is not expected to bring significant snow to the greater Denver area. Temperatures will be cold behind Saturday’s front. Here’s a look at the Canadian forecast 2 meter temperature snapshot for 12z (early Sunday) morning. 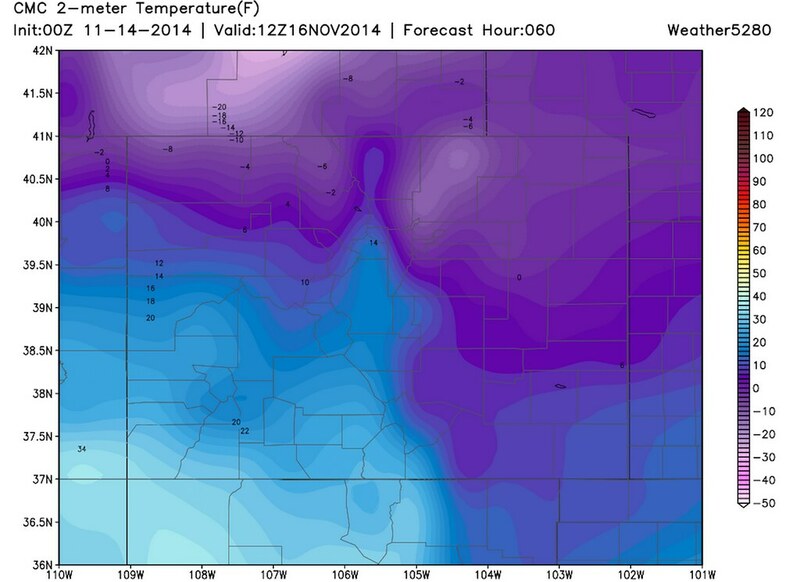 We’ll likely be back in the single digits in the Denver area, with the potential to once again drop below zero. Temperatures begin to moderate as we head into next week. We’ll have updates as needed here and on the Live Blog, stay tuned!